Description: Plants perennial, forming loose mats from numerous branched and tangled woody rhizomes; stems ascending-decumbent, 2-8 cm tall, minutely puberulent; stem leaves opposite, sessile, glabrous or with a few trichomes at the base, entire to serrulate, narrowly lanceolate to linear-lanceolate; inflorescence terminal, secund, +/- racemose; pedicels mostly 1-2 mm long, densely pubescent with gland tipped trichomes; sepals lanceolate, 5-8 mm long; corolla lavender, 12-25 mm; stamens included, anthers 1.1-1.3 mm long, dark purple, finely puberulent with scattered longer trichomes, opening across the connective; staminode bearded at the very tip. Flowers in July and possibly August. Similar Species: Penstemon bleaklyi is unlikely to be confused with any other species unless it is ultimately found to be growing with Penstemon harbourii A. Gray, which is currently known only from high elevations in Colorado. Penstemon harbourii has its staminode bearded for much of its length (vs. at the very tip only), leaves that appear blue-green (vs. green), entire leaves (vs. many leaves totally or partially serrulate), and a corolla that is 2-ridged ventrally (vs. not ribbed). Distribution: New Mexico: Taos County, Sangre de Cristo Mountains, Culebra Range in the vicinity of Big Costilla Peak. It probably extends into adjacent Colorado. Habitat: Alpine scree slopes composed of steep, decomposing, reddish, gneissic granite of the 1.69 billion-year old Jaroso Creek formation at known elevations of 12,500-12,900 feet. Remarks: This plant was discovered in 2012 by Ken Heil and Don Hyder while doing botanical surveys of Rio Costilla Park. 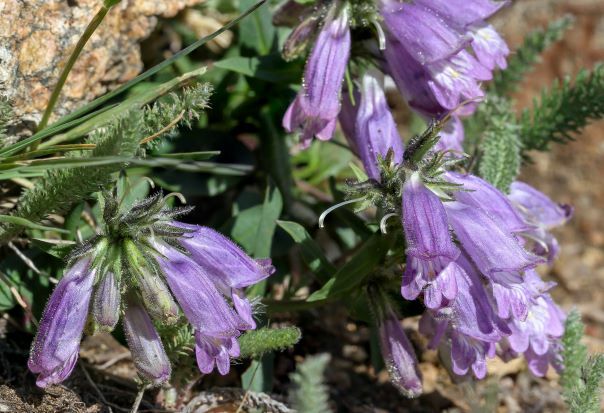 The name commemorates David Bleakly, NM botanist and student of the genus Penstemon. Conservation Considerations: There are no known, direct impacts from human activities. Climate change poses a possible long-term threat since the populations lie near ridge crests where upslope migration is limited. *O'Kane, S.L., Jr., and K.D. Heil. 2014. Penstemon bleaklyi (Plantaginaceae), a new high-elevation species from north-central New Mexico. Phytoneuron 2014-61: 1-4.